Description - A tan or reddish-brown in the summer and greyish-brown in the winter, the belly, throat, nose band, eye ring and insides of the ears are white. There are black spots on the sides of the chin. The antlers have individual tines that grow upward from each of the main beams. Distribution - The mule deer has the widest distribution of the deer found in British Columbia, occurring as far north as the Liard River Valley and throughout the interior as far west as the coast mountains. The whitetail deer resides in the lower south-east corner of the province. Found only in BC is the Northwest Whitetail deer. Biology - Deer are browsers rather than grazers and feed on a variety of vegetation including green plants, nuts and corn, and trees and twigs. Although the deer is a good swimmer and runner (reaching speeds of 35 mph) it falls prey to a number of animals including the cougar, domestic dog, wolf, coyote, lynx, bobcat and bear. Once this species was endangered but it is now more abundant than ever. Tracks - The mule deer has a distinct "bound" in which all four feet come down together as if on springs. The tracks will vary from a rough "V-shape" while running to a straight line with slower speeds. The track varies according to the surrounding landscape. In soft, woodland areas the print is more pointed and on harder ground where the hoof may be worn, the track may appear with a blunter tip. The hoof print may be described as two paisley shapes facing one another with smaller "dots" of the dew claws at the wider end of these paisleys. The key difference in distinguishing the gallop of the white-tailed and mule deer is while the mule tends to bound as if on springs, the white-tailed deer "rocks" by swinging its hind feet ahead of the front ones. 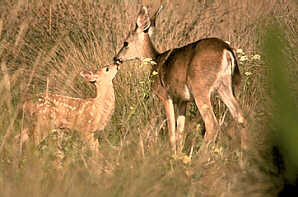 The white-tailed deer is known to drag its hooves between steps creating troughs between each print. The hoof print itself is nearly indistinguishable from that of the mule deer.